A 29-year-old woman is facing a raft of charges after a brazen daytime home invasion and police chase that ended in a rollover crash on the Pat Bay Highway. Police say the woman walked into the Crystal Pool and Fitness Centre in downtown Victoria around 1:45 p.m. Thursday, claiming she had been stabbed. But before emergency services could arrive, the suspect left, walking up Quadra Street into Saanich, where she broke into a house on Holmes Street, according to Saanich police spokesperson Sgt. Julie Fast. The suspect allegedly stole a set of keys for the homeowner’s Honda CRV. The homeowner was inside the house at the time, heard her CRV being unlocked and saw the suspect inside it, police said. The homeowner ran outside and confronted the woman, but the suspect reversed out of the driveway and drove off on Quadra Street. Saanich police responded to a 911 call and found the stolen vehicle northbound on the Pat Bay Highway, where they gave chase. The suspect allegedly refused to pull over and continued northbound, running a red light at Sayward Road. The pursuing officers determined it was unsafe to continue the pursuit and pulled over, police said. "A few minutes later, Central Saanich police responded to a roll over crash in the 7200-block of the Pat Bay Highway," Fast said in a news release Friday. 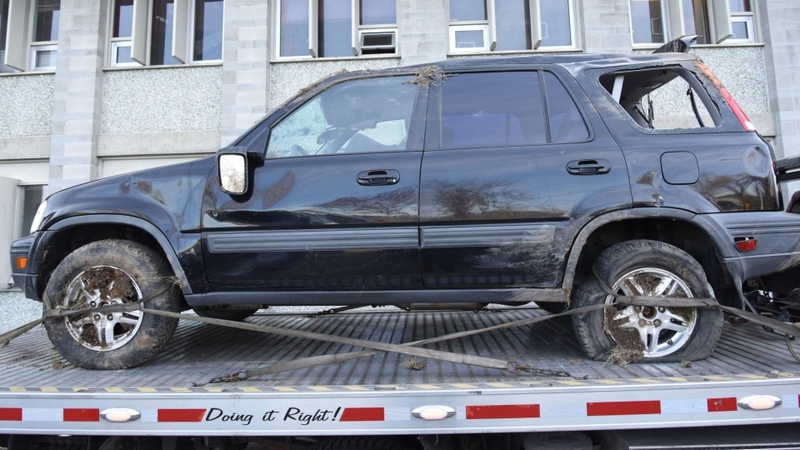 "It turned out to be the stolen CRV that had gone off the highway to the right. After crashing the CRV, the woman flagged down a passing motorist and asked to be taken to the Saanich Peninsula Hospital." However, the woman again walked off, trying to flag down another vehicle. "Central Saanich police soon located the woman running on Bourne Terrace and arrested her," Fast said. A 29-year-old woman with no fixed address was checked for injuries at the hospital and then released back into police custody, with only minor injuries and no evidence of a stab wound. The suspect faces several charges including break and enter, theft, dangerous operation of a vehicle and flight from police. She was held in police custody and is scheduled to appear in court Friday.